In the Emotion and Self Lab at the Department of Psychology at the University of British Columbia, we study the evolutionary function, nonverbal expression, and psychological structure of emotions and self. Much of our research is focused on the place that self and emotions meet: the self-conscious emotions of pride, shame, embarrassment, and guilt. But we also study more basic level emotions linked to moral behavior, like disgust, as well as other complex social emotions, like humility and schadenfreude. We use a wide range of methods to study emotional processes, including behavioral observation and coding, social-cognitive techniques (e.g., reaction time assessment, eye-tracking), cross-cultural and cross-species comparisons, narrative assessment, and physiological (e.g., hormone) assessment; and we use experimental, cross-sectional, and longitudinal designs. In an effort to improve the study of self-conscious emotions, we have developed several measurement tools that are available to other researchers. These tools can be downloaded from this website. In all of our research, we tend to take a functionalist perspective, asking why questions about emotions and self, and seeking both ultimate and proximate answers. Why Does Every Soccer Player Do This? Psychology Has the Answer. 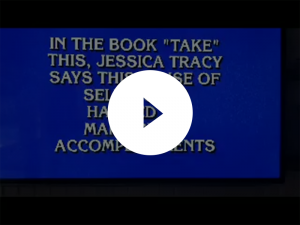 Jess and her book Take Pride featured as an answer (and a question) on Jeopardy! Our new paper – led by Zak Witkower- providing the first evidence for distinct nonverbal displays of dominance and prestige now in press at JPSP! Pharmacologically inhibiting physiological disgust (i.e., nausea) reduces the severity of moral judgments in the purity domain. Check out our paper, now published at JPSP. "Take Pride — now in paperback"
"The Psychology of Social Status"